Gaze showcases paintings and ceramics on loan from private collections by emerging, mid career and established female Australian artists including Jane Burton, Celeste Chandler, Julie Fragar, Kristin Headlam, Cherry Hood, Dai Li, Karla Marchesi and Fiona McMonagle. 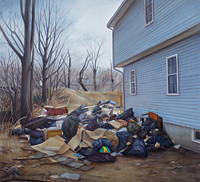 Each of these artists shares their observations with the viewer about people, relationships and place in unique and thought provoking ways. Curated by Emma Bain. Image: Karla Marchesi, As good as gone (detail) 2010, oil on board. Courtesy of the artist and Heiser Gallery.